Monogrammed Chevron, Stripe & Anchor Infinity Scarves Only $9.99! 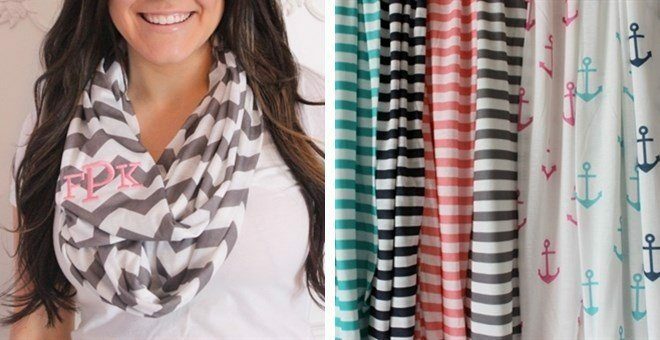 You are here: Home / Great Deals / Monogrammed Chevron, Stripe & Anchor Infinity Scarves Only $9.99! These are so adorable and make perfect Mother’s Day Gifts! Monogrammed Chevron, Stripe & Anchor Infinity Scarves Only $9.99! Several colors available in each design! Just choose your style, color and initials and you have a truly personalized great accessory! Grab this and other trendy fashion deals every day at Jane!